Tuberculosis Detection: Rats with an MD? Home » Careers in Global Health » Tuberculosis Detection: Rats with an MD? 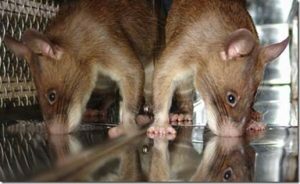 In October 2016 we published an article about the innovative Apopo HERO rats and their application to tuberculosis (TB) diagnosis and landmine detection. Today we are focusing in on the TB detecting rats, and their uncanny ability to diagnoses TB with their keen sense of smell. The Apopo TB detection program began modestly in 2007 with 4 government partnership clinics, but has since expanded to 28 collaborating clinics in Dar es Salaam, Tanzania and in Maputo, Mozambique. Tanzania and Mozambique are among the World Health Organization’s 22 high-TB burden countries, which can be partially attributed to inefficient TB diagnostic techniques. The Tanzanian national standard diagnosis via sputum microscopy is only 40-60% accurate, and can be even lower among HIV positive individuals. As a result, many individuals infected with TB aren’t captured by current diagnosis techniques and are sent home where they can infect anyone who comes into close contact with them. Thus, Apopo seeks to improve TB diagnosis, operating as a second-line treatment. The rats open their eyes at 4 weeks of age and are immediately socialized to develop a comfort for being routinely handled. The rats learn to associate the clicking noise to a food reward. Trainers offer rats a choice between positive and negative sputum samples. When the rats pause above a positive sample, they are rewarded with a food reward and clicking noise. The rats progress to evaluating multiple samples in sequence. The samples are orientated in a linear bar containing ten sputum samples. Here the rats are learning how to evaluate large numbers of samples in a short amount of time. The final test the rats face is to pass an internal accreditation process before joining the work force. The test is conducted under blind conditions, and to pass the evaluation, the rat must identify every TB positive patient in order to ensure high sensitivity. When rats indicate samples that were previously tested negative, the suspected sample is confirmed again in the lab. The Hero rats have caught almost 3000 wrongly diagnosed TB patients in just the past few years. 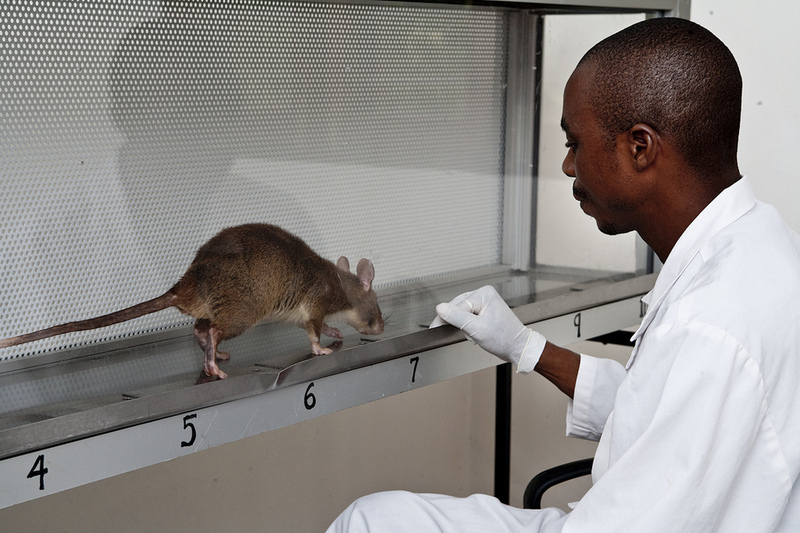 Once the accredited rats are ready to work, they fall in as a second line treatment for TB diagnosis, meaning they are used to confirm or discredit previously tested samples. The process begins when patients are tested at a collaborating clinic or hospital for TB using sputum microscopy. Samples are labeled with their test result, stored, and collected by Apopo on a regular basis. Apopo collects both positive and negative samples and the respective correlating patient codes. Although the rats are immune to most tropical diseases, the samples are still denatured in an autoclave to ensure the samples are no longer contagious. The samples are now ready for rat inspection, and are placed in a linear sequence under sniffing holes. The rat MDs pause and scratch at samples they think are positive for TB. A single rat can screen 100 samples in approximately 20 minutes, a process that would take a lab technician more than 2 days to process. The samples identified as positive by the rats are then confirmed via culture in the lab. All results either confirmatory or dissenting are sent back to their respective health centres to advise patient treatment. So far, Apopo TB detecting rats have positively identified 10,671 cases of TB, screened more than 390,485 samples, and stopped 81,390 potential infections. Apopo was ranked the top-rated non-profit on GreatNonProfits for 2nd year in a row and were awarded the opportunity to exhibit work at the World Innovation Summit for Health on TB-detecting rats. 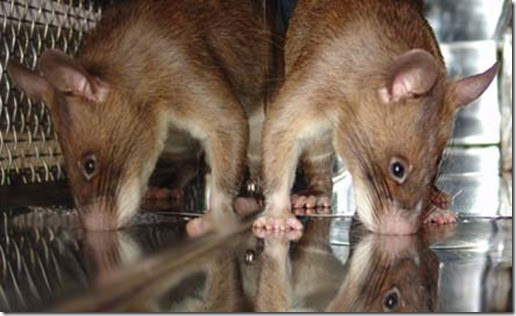 For more information on the Apopo rats please visit their website.